Facebook,the fastest growing social network in the world providing its users to add their friends to facebook groups.It may a big disturbance for you ,if your friends are adding you to more and more groups.If you are referred to a group probably you will get updates from that groups. Consider if you are joined in the group having 10000 members!.If some one comment or post on that group what will happen?your inbox will flood with the notifications. Now I am going to explain How to edit settings for groups to remove notifications or to leave group. Now click on the edit settings tab.A pop up will be appeared with the settings for that group.There you can edit the notifications such as email notification,chat notification and homepage notifications. Once you are selected the options you can click save settings.You are done! Remember one thing when you try to leave a group.Your friend never add you to a unwanted group.If again want to leave a Facebook,Then read below else continue with the group with full of fun.. If you are ready to leave a group we can proceed.First of all you have to get into the group in which you want to remove or leave. 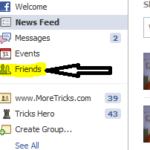 Once you reached the homepage look to the right side bar.There will be an option that Leave Group.Just click on it. Now you will get a pop asking the confirmation to leave group.You can click leave group. Once you are left the group,your friends are unable to add you to the same group again.If you wish to join the group again visit the group and Click Ask to Join Group. I think this information was helpful for you! Love the blog, I’ve listened to caspa like 26 times today. Keep up the blog man! That’s a great tip to leave Facebook groups. Thanks for sharing!